Guerrilla illuminators bringing protest art to New York Jump to media player Newsnight's Paul Mason meets the New York artists affiliated to the Occupy protests who are creating a new cultural movement. Protesters welcome fresh HK talks Jump to media player An offer from Hong Kong's Chief Executive to resume talks is cautiously welcomed by some pro-democracy protesters. HK 'ready for talks with protesters' Jump to media player Hong Kong's government says it is ready for new talks with student protesters but warns Beijing will not back down on vetting candidates for the 2017 election. 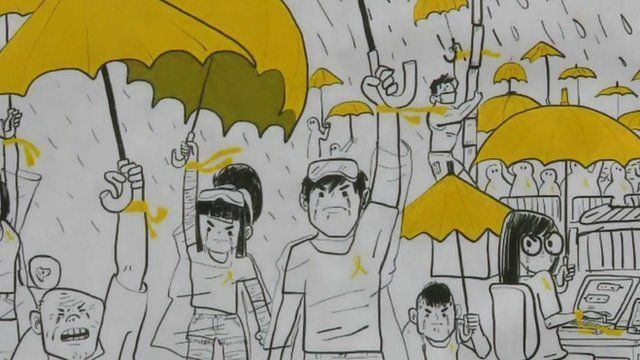 Over the past three weeks, the umbrella has become an unofficial symbol of the pro-democracy protest movement in Hong Kong. The everyday object has spawned an art movement all of its own, with artists creating open-air galleries in the barricaded streets.